Congratulations, UCLA Anderson Class of 2018! The Gloria Appel Prize is given annually to graduating MBA students who have demonstrated outstanding achievement in entrepreneurial studies and student leadership. The full-time MBA students who received this award excelled in three or more entrepreneurial electives, while also taking on leadership roles at Anderson. Candidates with superior academic achievement in strategy and policy are recommended and chosen by UCLA Anderson policy and strategy faculty. Factors entering into the selection decision include the students’ revealed preference for strategy and consulting as well their excellence as a TA and their potential academic research contributions. China is where Fritz Demopoulos (’97) decided to launch his career and make his life after b-school. Turning down a lucrative ― and stable ― offer in Europe, Demopoulos trusted his instinct for opportunity and headed for Asia. Demopoulos founded Qunar, China’s biggest online travel company, and Shawei, its largest web-based sports portal. He’s held senior positions at Net Ease and The News Corporation and worked as an executive in the Chinese media, internet and wireless industries. An entrepreneur and investor, he is a founding partner of venture capital firm Queen’s Road Capital, which focuses on entrepreneurial investments across Asia. UCLA Anderson’s 2018 commencement ceremony, like others before it, celebrated the degrees and accomplishments of the newest graduates of its three MBA programs, along with a scattering of brand new Ph.D.s. But unlike any such event at Anderson in more than a dozen years, Friday’s celebration also marked the end of an era. On July 1, Dean Judy Olian will become president of Quinnipiac University in Connecticut, making this year’s graduation the last time she will confer Anderson degrees and preside over its commencement. Before delivering personal remarks, Olian introduced the afternoon’s keynote speaker, William S. (Bill) Anderson (J.D. ’88), son of the school’s namesake,Topa Equities founder John E. Anderson (’40). The late John Anderson and his wife Marion, who passed away in 2017, are the institution’s most generous benefactors, together with Bill Anderson and his siblings. In his address, Anderson spoke movingly about the concept of change and his admiration for those in the business world who find the courage to take a risk. Anderson then told of his own long-debated decision to leave the family business where he had worked alongside his father, to strike out on his own. Anderson referenced his experience in the beverage industry, saying a few risk-taking craft beer brewers had challenged and changed an industry once dominated by a handful of established major brewers. Returning to the podium after the keynote, Olian characterized her long, successful tenure as Anderson’s dean as “a lot of learning.” She shared with the graduates five lessons she said she would carry with her. Next, she referenced the Anderson quality of sharing success. “I’ve learned that if you’re surrounded by a great team, a lot can happen,” she said, “way more than you could ever achieve by yourself. Devon Dickau (’15), is the 2018 recipient of UCLA’s Young Alumnus of the Year award. The recognition was announced by Associate Vice Chancellor Julie Sina with the formal presentation to be made at an awards ceremony and dinner in June. He is a “double Bruin,” earning his undergraduate degree from UCLA in 2007 with a B.A. in American literature and culture. He also holds an M.Ed. in technology, innovation and education from Harvard University. Currently, Dickau is a manager in Deloitte’s Human Capital Consulting practice and chief of staff for the Diversity & Inclusion Client Service Center of Excellence. Prior to joining Deloitte, he worked as a community educator in rural Tanzanian villages; a social impact consultant for the entertainment industry; and a higher education administrator, including as a co-founder of UCLA Parent & Family Programs. Anderson Student Association – Section President (2013–14); VP, Student Affairs (2014–15). In the latter role, he came up with the idea of shooting the “brick background” portraits for all students at the beginning of the school year. He also founded the Club of the Month honor and partnered with the school’s marketing and communications office to design the first-ever standard club posters. Net Impact – Director, Impact Media/Technology (2013–14); Chair, Center for Social Innovation Planning Committee (2014–15), helping in this role to found Impact@Anderson. Out@Anderson – Director, Outreach (2013–14); Co-President (2014–15). He founded Anderson LGBTQ Awareness Week and worked with the marketing and commuications team on the first-ever LGBTQ-specific Anderson website. Devon Dickau is the recipient of the 2018 UCLA Award for Young Alumni Volunteer of the Year. A mentor, volunteer and philanthropist, Dickau serves as co-president of the UCLA Lambda LGBTQ Alumni Association. Previously serving as co-chair of the UCLA Young Alumni Development Council, he was the founding assistant director of UCLA Parent & Family Programs and a 2016 Fellow with New Leaders Council. He is a manager in Deloitte’s Human Capital Consulting practice and chief of staff for the Diversity & Inclusion Client Service Center of Excellence. Dickau serves on the board of the Social Impact Fund, a community nonprofit organization providing management and oversight expertise to nonprofits undergoing the IRS 501©(3) determination process. Passionate about nurturing and empowering communities in challenging environments, Dickau facilitates design-thinking workshops and advises clients across sectors on diversity and inclusion, culture, talent and leadership. He emphasizes aligning corporate strategy with social values. After earning his bachelor’s degree in American literature and culture, Dickau moved to Africa where he worked with a non-governmental organization in rural Tanzania. Among his UCLA support, Dickau is a gold level member of the Alumni Association benefitting scholarships, and UCLA Anderson School of Management, where he received an M.B.A. In addition to his UCLA degrees, he holds an Ed.M. in Technology, Innovation and Education from the Harvard Graduate School of Education. Read the complete list of 2018 UCLA alumni awards. 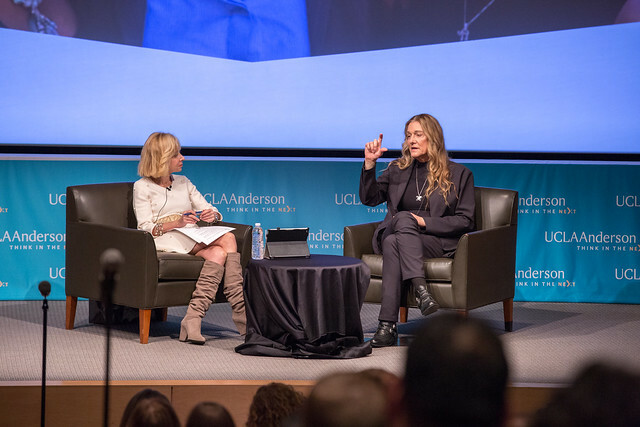 Allow UCLA Anderson’s Dean Judy Olian to set the record straight: “Martine Rothblatt is the most interesting person you will ever meet,” the dean said in welcoming Rothblatt back to Anderson this week. Rothblatt (B.A. ’77, MBA/J.D. ’81), whose company United Therapeutics is based in Silver Spring, Maryland, returned to UCLA to be honored with the UCLA Medal in a ceremony at the home of UCLA Chancellor Gene Block. Before the medal ceremony, Rothblatt participated in a lively question and answer chat with Olian as part of UCLA Anderson’s Dean’s Distinguished Speaker Series. The Class of 2017 is the ninth graduating class in the history of UCLA Anderson’s Master of Financial Engineering program. But the class also represents a first — as in, the first time two cohorts of students graduated from the program at the same time. The 78 students (from 18 countries) who earned their degree set a record number, collectively embodying the growth of the program since its inception and the strength and relevance of the Anderson MFE degree. UCLA Anderson Dean Judy Olian addressed the graduates and assembled guests at what is always one of the most familial gatherings on the UCLA Anderson calendar. She reminded the graduates that although their understanding of the technical side of finance is important, their work is as much art as it is science. As part of a select group whose decisions might ultimately impact financial markets, Olian made it a point to remind the graduates that their work comes with significant responsibility.